Here in New York City, the historical chance of having a white Christmas is about 12%. This low probability is largely due to the city’s proximity to the Atlantic Ocean and its moderating influence on temperature. This year, with record breaking warm temperatures in the forecast, the city’s already minimal chance for snow has largely melted away. The December solstice – the first day of winter in the northern hemisphere – is upon us. The new season officially begins at 04:48 UTC on December 22nd, which is 11:48 PM EST tonight. The astronomical seasons are produced by the tilt of the Earth’s axis – a 23.5° angle – and the movement of the planet around the sun. During the winter months, the northern half of the Earth is tilted away from the sun. This position means the northern hemisphere receives the sun’s energy at a less direct angle and brings us our coolest temperatures of the year. Since the summer solstice in June, the arc of the sun’s apparent daily passage across the sky has been dropping toward the southern horizon and daylight hours have been decreasing. Today, it will reach its southern most position at the Tropic of Capricorn (23.5° south latitude) marking the shortest day of the year. This observable stop is where today’s event takes its name. Solstice is derived from the Latin words “sol” for sun and “sisto” for stop. Starting tomorrow, the sun will appear to move northward again and daylight hours will slowly start to increase. Marking this transition from darkness to light, the winter solstice has long been a cause for celebration across many cultures throughout human history. Our global temperature continued its seemingly unending upward trend last month with November 2015 marking not only the warmest November on record, but also closing out the warmest meteorological autumn ever recorded for the entire planet. According to the State of the Climate report by NOAA’s National Centers for Environmental Information, Earth’s combined average temperature for the month – over both land and sea surfaces – was 56.95°F, which is a whopping 1.75°F above the 20th century average. It surpassed the previous record set in 2013 by 0.27°F and was the second highest departure from average for any month ever recorded. The highest departure (1.79°F) occurred last month. November also marked the seventh consecutive month this year to break a monthly temperature record. The three-month period of September, October, and November – known as the meteorological autumn in the northern hemisphere – was also a record breaker. The planet’s temperature for the season was 58.83°F, which is 1.73°F above average. That is also 0.38°F above the previous record that was set just last year. While heat dominated most of the planet this autumn, some places were particularly warm, including North America. Here in the contiguous US, with a seasonal temperature of 56.8°F, which is 3.3°F above average, it was our warmest autumn on record. The previous record was set in 1962. Although strong El Niño conditions –a periodic natural climate phenomenon – helped fuel this record warmth, it does not tell the whole story. The long-term trend of human-caused climate change was also a key factor. NOAA reports that fourteen of the fifteen warmest years on record have occurred since 2000 and they were not all El Niño years. Year to date, the first eleven months of 2015 were the warmest of any year on record. At this point, December’s global temperature will have to be significantly below average to prevent 2015 from surpassing 2014 as the warmest year ever recorded on this planet. Global temperature records date back to 1880. The official start of winter is a week away, but you would never know it in the eastern United States. Temperatures have been so warm that is feels like spring and heat records across the region are being shattered. Here in New York City, daily high temperature records have been tied or broken for three consecutive days. On Sunday, the temperature reached 67°F in Central Park, breaking the old record of 64°F from 1923. Monday’s high of 67°F tied the record from 1881 and today, in the early morning hours, the mercury climbed to 68°F surpassing the previous record of 67°F from 2008. Evening temperatures have also been exceptionally warm. In fact, the overnight lows have been warmer than the average highs for the past few days. Sunday even posted a new record maximum low of 55°F. The city’s normal high for this time of year is 43°F and the normal low is 32°F. The primary driver of this unseasonable warmth is El Niño. It has produced a large ridge in the jet stream over the eastern part of the country that is allowing warm air from the south to flow further north than it normally would at this time of year. To date, according to the NWS, the city is running 12.1°F above average for the month. While this warm weather can be easy to get used to, it makes all the holiday decorations around town feel out of season. So, I guess we can say that El Niño is the Grinch that stole Christmas this year. After decades of failed attempts, a global climate change agreement was reached at the UN Climate Conference in Paris (COP 21) on Saturday. The deal, known as the Paris Agreement, marks the first time in history that all member nations agreed to reduce their greenhouse gas emissions in some way. In the past, only developed economies like the US and EU were required to act while less developed economies like India and China were exempt. This was one of the major reasons why previous attempts to reach a worldwide climate agreement failed. The more universal approach used this time was largely attributed to, and builds on, last year’s bi-lateral climate pact between the US and China – the worlds two largest carbon polluters. More than a year in the making, this hard won agreement has set the target of holding global warming to 2°C (3.6°F) above pre-industrial levels and urged countries to pursue an even tighter cap of 1.5°C (2.7°F) if possible. To achieve this goal, it employs a mix of voluntary and legally binding actions. While every country will follow their own emissions reduction plan, there is no requirement quantifying the amount of greenhouse gases they have cut or how it has to be done. Additionally, there are no penalties for those who do not live up to their promises. Based on the current collection of national plans, which vary widely in ambition, this agreement will only cut greenhouse gas emissions by about half of what is necessary to reach the 2°C (3.6°F) goal. But, the agreement does legally obligate countries to reconvene every five years to present updated plans spelling out how they will deepen their emissions cuts. It also requires countries to publically report how much emissions they have actually eliminated compared to their plans every five years starting in 2023. The ultimate outcome of this historic deal will not be known for years to come, especially since it depends heavily on the tactic of “name and shame” and the hope that no country wants to be seen as a slacker in the eyes of the world. It is also deeply dependent on the actions of future government officials who will have to carry out these plans. That said, the global participation and overall spirit of the agreement is, without a doubt, a solid step in the right direction in terms of addressing climate change. The Paris Agreement goes into effect in 2020. Today, as a personal weather station owner in New York City, I was invited to make a second appearance on the Weather Channel’s new show Weather Underground TV (WUTV). A huge fan of the program, I was thrilled to be asked back! We discussed the unusually warm temperatures in the Northeast, the rainy conditions for the Rockefeller Center Christmas Tree Lighting ceremony, and the low probability of seeing a white Christmas in the city. We even touched on how NYC’s public transportation system helps commuters avoid the problems that rain and fog can cause in other places. The show, which airs on weeknights, is co-hosted by Mike Bettes and Sarah Dillingham. It covers breaking weather news and taps a bevy of experts to dive into the science behind different weather events. It is always worth watching. 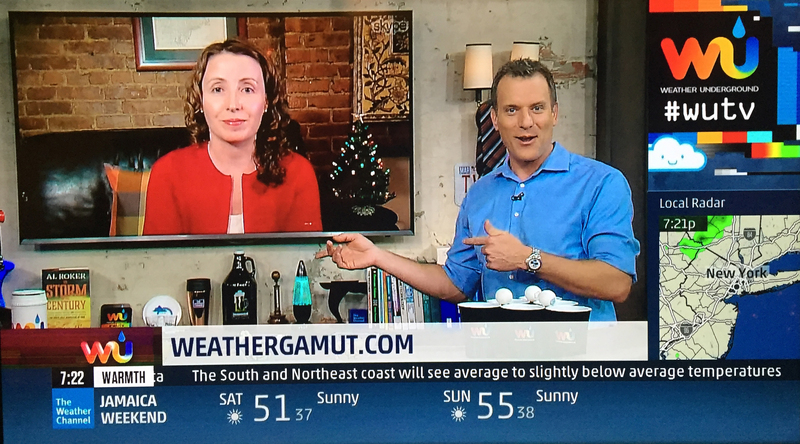 “Weather Gamut” writer, Melissa Fleming, talks with Mike Bettes on WUTV. 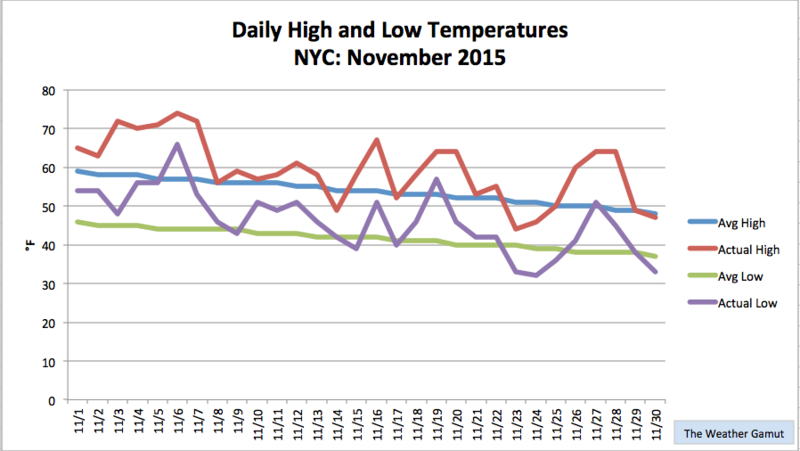 The autumn of 2015 brought exceptionally warm conditions to New York City. According to the NWS Central Park climatological station, it tied 1931 for the all time warmest meteorological Fall (September, October, November) on record. 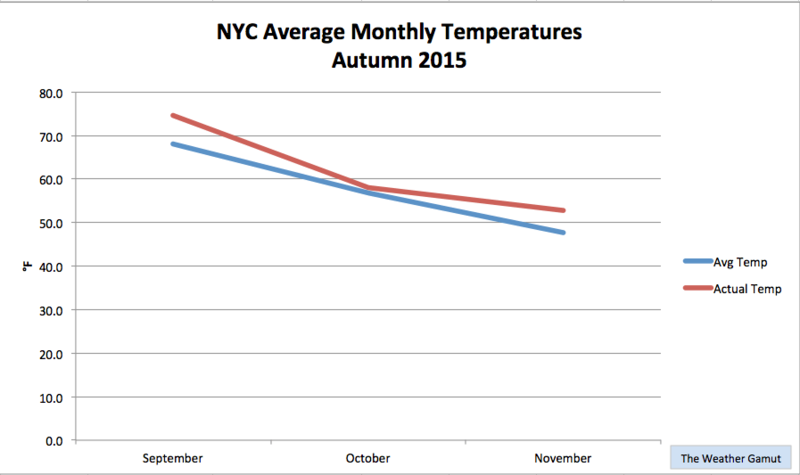 Overall, the city’s average temperature for the past three months was 61.8°F. That is 4.2°F above average. Looking back, every month of the season was above its long-term norm. In fact, September and November each broke their monthly temperature records. While winter is coming and overall temperatures are dropping, they are warmer than average for this time of year. The main reasons for this are likely a combination of global warming and a strong El Niño, which tends to push the jet stream further north than normal. Weather records for Central Park date back to 1869. November felt down right balmy in New York City this year. With an average temperature of 52.8°F in Central Park, which is a staggering 5.1°F above average, it was the city’s warmest November on record! The previous record was set in 2001. Overall, we had twenty-two out of thirty days with high temperatures above average. Five of those days posted readings in the 70s, including November 6th when the mercury soared to 74°F in Central Park, tying the record high for the date that was set in 1948. Nine days saw temperatures in the 60s. Overnight lows were also mostly above normal. Historically, our average temperature for the month is 47.7°F. November’s unseasonable warmth was produced by a fairly persistent ridge in the jet stream over the eastern US. It allowed warm air from the south to flow further north than it normally would at this time of year. 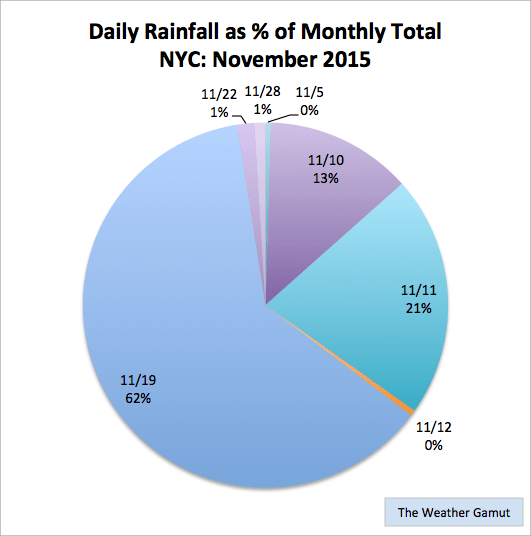 In terms of precipitation, November was unusually dry and marked the fifth consecutive month that NYC received below average rainfall. In all, we received 2.01 inches of rain, which is 2.01 inches below normal. More than half of this modest total fell on a single day. The city, according to the latest report (11/24) from the US Drought Monitor, remains in a moderate drought.